The Summer of 2011 saw the community based project led by the Droitwich Canal Trust to re-open the Droitwich Spa Canals come to fruition. The only 'whole canals' to be fully restored in almost a decade, the Droitwich Spa Canals are the final link in a brand new 'cruising circuit' – the Mid-Worcestershire Ring. The ring allows boats, cyclists and ramblers to make a 21-mile circular journey through some of the UK's most beautiful and historic countryside, fom the Worcester & Birmingham Canal to the River Severn, through the city of Worcester and back again. More than 70 years after the Droitwich Canals were officially abandoned, they were formally open to the public on 1 July 2011, following a weekend of celebrations which also mark the 240th anniversary of the canals original opening. The Droitwich Canals Trust continues its great work but with a name change... it is now called The Droitwich Waterway (Pamela May) Trust. Download a FREE GUIDE to Worcester, Droitwich Spa and Stourport canals. The 'Pamela May' is a trip narrowboat based in Vines Park on the newly restored Droitwich Barge Canal. She operates as a community boat by a group of RYA qualified volunteers to give disabled, elderly, and disadvantaged members of the community, accompanied by their carers, an opportunity for quality time with others. The boat is fitted with a powered lift and toilet facilities with wheelchair access. 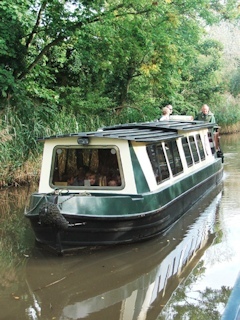 Pamela May also provides trips for other community groups to promote interest in the waterways.